is a historian of science. He blogs at The Renaissance Mathematicus and edits Whewell’s Gazette. He lives in Germany. If you ask people to name the greatest scientist of all time, many will most probably answer: Galileo. In the popular presentations of the history of science, he is portrayed as a one-man revolution, an intellectual superhero who dragged science kicking and screaming into the modern era. Even Stephen Hawking validates this view: ‘Galileo, perhaps more than any other single person, was responsible for the birth of modern science,’ he wrote in A Brief History of Time (1990). In popular books and websites, Galileo is regularly credited as the inventor of the scientific method, the first to apply mathematics to science, the discoverer of the first mathematical law of science, and on and on. The descriptions sound too good to be true – and they are. Galileo’s vast reputation, and the hyperbolic accolades that go with it, are not justified by the real history. With a corrected perspective on the man comes a rich and compelling pair of questions: what did Galileo actually achieve, and where does the science superhero image come from? In 1609, Galileo Galilei was a 45-year-old, largely unknown, north Italian professor of mathematics, a profession with a low social status, well on his way to total obscurity. He had produced his brilliant experimental demonstrations of the laws of falling bodies years earlier but had not published them. He was known among his circle of friends as a purveyor of good wines and a castigating, razor-sharp wit. Then Galileo stumbled upon the recently invented telescope and began the astronomical observations that would make him famous. Realising that he had lucked onto the scientific equivalent of winning the lottery, he rushed into print in early 1610. Overnight, Galileo became the most renowned astronomer in Europe. However, he was not the only telescopic astronomical observer at the time, and all the discoveries he made were made independently and contemporaneously by others in Britain, Germany, even Italy. This point is hard to reconcile with the modern myth because even if Galileo had never used a telescope, it would not have changed anything in the history of astronomy. Having parlayed his discoveries into a new position as court philosopher and mathematician to the Medici in Florence, Galileo’s fame rested largely on those telescopic discoveries and his demolition of scientific opponents in public debates and in his writing. Although his defence of Copernicanism – presented in his book Dialogue Concerning the Two Chief World Systems (1632) – brought him that notorious Inquisition trial and house arrest, it did not, as popular opinion has it, win the day for heliocentricity. That honour goes to the much duller tomes of Johannes Kepler, whose work Galileo had ignored in his own volume. In all his scientific endeavours, Galileo did not stand alone, as he is often presented. Rather, as with the telescopic discoveries, he was part of a sizable community all working on the same problems. Even his greatest scientific work, the Discourses and Mathematical Demonstrations Relating to Two New Sciences (1638), was shadowed by the independent work of others, such as the Flemish mathematician Simon Stevin and the Dutch natural philosopher Isaac Beeckman. Galileo achieved considerable fame in his lifetime, but in the 17th century his reputation rested firmly on his telescopic discoveries. His contribution to the debate over the heliocentric view of the solar system was rather minimal, and despite the best efforts of Marin Mersenne (the century’s greatest science communicator) to publicise his Discourses, they didn’t have that great an impact. Today it is often claimed that Galileo is one of the giants on whose shoulders Newton stood, but he plays a rather minor role in Newton’s masterwork, Principia Mathematica (1687). 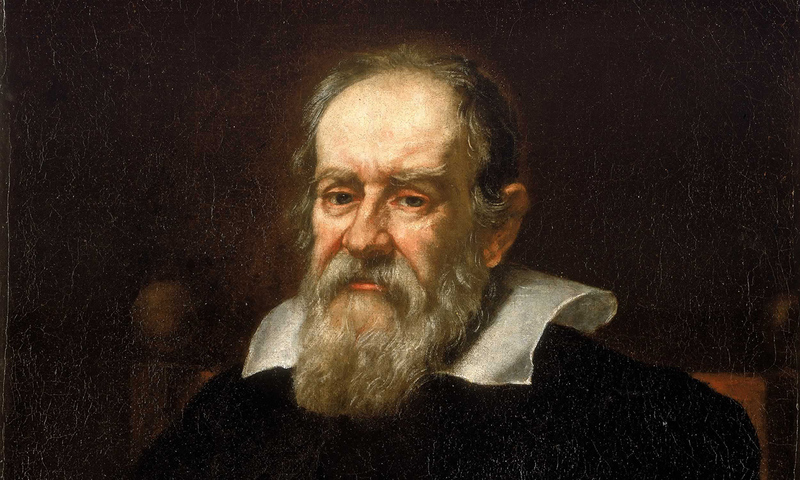 By the 18th century, Galileo was slipping into obscurity outside of Italy. Then he experienced a remarkable resurrection. Galileo’s rise to immortality starts at the end of the 18th century. In this period, scientific biography started to become popular, and Galileo became a favourite subject, largely because of his persecution by the Catholic Church. This effect was immensely magnified by the largely mythical war between science and religion in the late 19th century, waged by two US-based scientist-historians, John William Draper and Andrew Dickson White. They wrote passionately about religion as an obstacle to the forces of progress, and advanced a self-congratulatory thesis in which Western civilisation had steadily emerged from the ignorance of the Dark Ages to the modern age of Enlightenment. This was an outgrowth of the broader rejection of the dominance of religious thought, which had emerged in Europe during the Enlightenment and had been enthusiastically adopted by influential American intellectual figures including Thomas Jefferson and Benjamin Franklin. To fit into this narrative, Galileo was presented as a solitary hero defending Copernicanism against the ignorance and prejudice of the Church. Draper and White also promoted the notion that medieval scholars, blinded by theology, had believed the world was flat – another myth that has wormed its way into generally accepted truth. Galileo’s elevation to scientific sainthood was aided by his sharply worded publications. His talents as a scientist were considerable, if overrated, but his greatest skill was, without doubt, that of a writer. His scientific publications are masterpieces of rhetoric and polemic, delightful to read, informative and entertaining. The Discourses, his most important scientific work, contains beautiful illustrations by Galileo himself, proving that he was also an able artist. In comparison, the works of Kepler, Stevin and their contemporaries are turgid and boring, difficult to read and to comprehend. By the early 20th century, more than two centuries after his death, Galileo had fully become the Master of the Universe that his Victorian biographers created. So how should we evaluate Galileo today? He was a superb experimental scientist and astronomical observer, a gifted instrument-maker, and an inventive theorist, who was among the first rank of investigators developing modern science in the first half of the 17th century. But, and it’s a very big but, he was not alone. Galileo was part of a collective, a whole community of brilliant thinkers who were expanding the boundaries of science. Take off the superhero garb placed on him by his later biographers, and it is clear that Galileo wasn’t the father of anything. He didn’t invent the scientific method. He wasn’t the first to apply mathematics to science, nor did he discover the first mathematical law of science. His telescopic observations were exquisite, but not unique. He did make several important contributions to the development of both science and technology, and he presented his work in exemplary style. I would be tempted to call Galileo primus inter pares – first among equals – within the scientific community of his time, were it not for Kepler, the mathematical visionary who deduced the orbital shapes and laws of motion that guide the movements of the planets. Although he enjoys a far less popular reputation, Kepler contributed more than Galileo to the development of modern science. You might more properly acclaim him as a hero. Most accurately, though, you would recognise science for what it truly is: a group activity of great minds collaborating, challenging and goading each other into the unknown.